Let me begin today’s post with a personal story. Several years ago, I visited Thessaloniki. When I first arrived, I was stunned by how ugly the city is. Block concrete buildings dominate every street corner and every skyline. Graffiti is everywhere and any attempt to clean it only results in new graffiti. Part of the shock was due to the fact that the city is littered with byzantine churches, relics and scriptural provenance. It was with a great sense of irony that one not only could not see most of the churches from a distance (they were surrounded by these towering blocks of concrete), but one had to descend beneath street level in order to enter. All of this ugliness and seeming disregard for the holiness that is literally at ones finger tips in every section of the city angered me. I was due to stay for a number of weeks and was in no mood to have to witness this physical edifice that seemed to prefer the straight, grey concrete lines of 20th century secularism over the complex beauty of ancient Christianity. Part of my own journey to Christianity, however, was a retreat from the self-destructive anger of a cynical youth. Anger requires so much energy and so much time — neither of which I have any desire to spend wasting on things over which I have no control. Therefore, I spent most of my time in Thessaloniki searching for beauty. I found it by ignoring the skyline and focusing on the intimate and the small. At the time I had no idea who this women was, why the tree was bent over or why she held three apples, but I was bound and determined to find out. 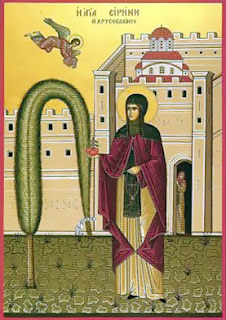 Her name is Irene the Righteous of Chrysovalantou and today is her feast. Irene lived during the ninth century and was originally from Cappadocia. She was chosen to be betrothed to the Emperor Michael (whose mother St. Theodora ended the period of Iconoclasm by restoring the icons to the churches). On her journey to Constantinople, however, she was told by St. Ioannicius that she was needed at the monastery of Chrysovalantou. She therefore proceeded to meet the Emperor with great trepidation, knowing she would have to reject the betrothal; however, (with great relief) she found that Michael was already married when she arrived. Therefore, she spent the rest of her life as a monastic at Chrysovalantou where she eventually became abbess. The bent tree comes from an account of one of the nuns from the monastery. St. Irene had the practice of keeping an all-night vigil in the courtyard throughout the night of the Great Feasts of the Church. The nun, unable to sleep, witnessed St. Irene floating in air with the cypress trees in the courtyard bowing to her. When she was done with her prayers she blessed each tree in turn and they went back to their original position. The apples come from an account of a sailor of Patmos (where St. John the Evangelist lived out the end of his life). As the sailor set sail, he saw an elderly man on the shore telling him to stop — which the boat did despite the wind and the current. The man then walked across the water and gave the sailor the apples with the instruction to give them to St. Irene with the message that they were a gift and came from John in Paradise. There are parishes that to this day bless apples on this feast. These rare fruits reportedly come from the trees of the Garden of Eden. They are immune to decay and will remain fresh and unbruised until they are consumed. Each fruit has 1d6+1 bites before it is consumed. Taking one or more bites from the fruit will confer to the recipient any healing spell from the Cleric Spell List. Higher level spells, however, require one bite per level of the spell. For example, a Cure Light Wounds spell requires one bite and a Neutralize Poison spell requires four bites. As I noted in my last post, I have been traveling a lot lately, mostly by car. In order to pass the time in an entertaining way (particularly for the kids) we’ve been listening to the Star Wars Radio Drama. I don’t remember when I purchased this set of good ‘ol fashioned CDs, but I haven’t listened to them for years…and had forgotten just how good they are. Let me just say, before I go any further, that I acknowledge the fact that George Lucas has every right to fiddle as much as he wants to with his movies (since he created them, owns them, etc.). I also reserve my own right to say that much of that fiddling has curbed my enthusiasm for the franchise (I haven’t actually sat through an entire movie — even my old VHS copies of the original versions — in almost a decade). I also reserve my right to throw my hat into the ring as a Han-Shot-First kinda guy. Personally, in context of the story, it not only makes sense, but I always thought it essential to the story arc of his character. His decision to turn around and join the Battle of Yavin at the last moment has more meaning. The story arc is even stronger in the thirteen episode radio play (almost 6 hours) where so much of the story is driven by what the characters say (audio) vs. what they do (visual). Han is much more of a shady and untrustworthy character at the outset than he is in the movie (even before George started fiddling). Obi-wan does make few interesting observations that set the stage for both Luke and Princess Leia having conversations with Han on Yavin trying to convince him to fight. And in that moment when Han does show up at the end to allow Luke enough time to fire off his shot to destroy the Death Star, I got just as many goose bumps as I did in the movie theatre, despite knowing how everything ends and despite not having all those fantastic visuals. There are several things going in the Radio Drama’s favor. The script was written by Brian Daley (who wrote the Han Solo Adventures). His superior writing skills (when compared to George) and his familiarity with the early expanded universe made him perfect for this role. 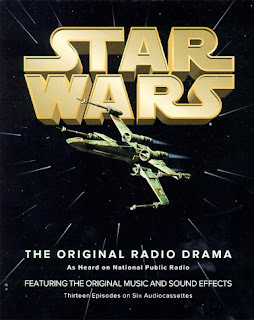 The Radio Drama had access to both John Williams’ music and the special sound effects of Brian Burtt. There are some seriously cool episode titles like "A Wind to Shake the Stars," "While Giants Mark Time," and "The Jedi Nexus." Star Wars was inspired by the episodic serials of early Hollywood. The Radio Drama actually allows it to be an episodic serial. There are a lot of interesting background stories that get filled in that are suggested by the film, but are never dealt with. As a result we get to see Dark Vader as the seriously evil bad guy that he was always meant to be. Mark Hamill (one of the two original cast members available to do the play) is a better voice actor than he is a screen actor (being my favorite Joker of all time). The other is Anthony Daniels. Both lend enough audial familiarity that you don’t mind not having the rest of the cast. George Lucas actually sold the rights to KUSC (reportedly for one dollar). He therefore cannot fiddle with this production as he has with the films. Therefore, if (like me) you prefer Han shooting first, then take a listen. I know I will be going back to the Radio Drama a lot sooner and a lot more often than I will the movie. First, let me apologize for not posting a whole lot lately. Life intrudes. I have been traveling a lot. My actual time gaming has been much reduced, giving me less to muse about. Fortunately, today is the feast of St. Symeon the Fool for Christ. Symeon was part of a group of monastic saints from Edessa in Mesopotamia (now in modern day Turkey). After making a pilgrimage to Jerusalem in the middle of the sixth century, Symeon and his companions were moved to take up the ascetic life. After being tonsured, they went out into the wilderness of the Dead Sea where they remained for several years. Moved by the Spirit, Symeon left the desert for Emesa in Syria, where he became a Fool for Christ. This is a title given to saints who endeavor to bring ridicule upon themselves by appearing to be insane; however, this state of mind is actually a kind of holiness. These fools are able to expose evil through direct criticism, metaphoric actions and symbolic words. They force people to face their own sin in a way that other, more “civilized” methods cannot. St. Symeon, through this holy insanity was able to save many from their sins. He died in peace in the year A.D. 570. Of all the various types of NPCs one can throw into a game, the one I enjoy playing the most is the Fool for Christ, not only because they are hilarious characters that illicit strong reactions from players, but because they are extremely useful. A Fool for Christ is a wonderful way to personify the omniscience of the Referee into a game world. Normally such a character would take the form of an extremely powerful wizard or other highly magical NPC quite capable of completely decimating parties and player choice. A Fool for Christ, however, need only be a 0-level human. Being a holy person, intimate with the Holy Spirit gives them all the knowledge the Referee needs them to have. Given their relative weakness, this allows me as a Referee to impart critical information (and even some constructive criticism) in an entertaining way while letting the players know and feel that they are still in charge of their characters and where they want to take the campaign. Today is the feast of St. Nicodemus of the Holy Mountain. Born Nicholas Kallivourtzis in Naxos, Greece around 1749, he went to Mt. Athos to become a monk at the Dionysiou Monastery in 1775. While he was part of a group of monks that revived hesychasm (a mystical prayer practice which uses the Jesus Prayer — “Lord Jesus Christ, Son of God, have mercy on me the sinner”), he is far more famous for his literary efforts. 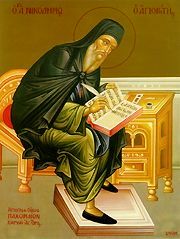 In 1777, St. Makarius of Corinth gave him three texts to edit and revise. Among these was the Philokalia, a book of huge spiritual import of which I have mediated on before. St. Nicodemus would also go on to edit On Frequent Holy Communion and the Evergenitos, write hagiographies and liturgical poetry and translate several Western Christian works, especially from the Jesuit tradition. Ironically, St. Nicodemus is far more popular in Orthodox lands outside of his native Greece — particularly in Russia where the Philokalia has had a much deeper influence. Due to “Western Influences” (his interest in Roman Catholic writings) he is still approached with some trepidation. Personally, I find this unfortunate because his contributions are manifold. It occurs to me that there are various tables available to come up with random book titles, but most have to do with historical or arcane subject matter. Since St. Nicodemus was such a prolific writer, editor and translator, I thought it appropriate to come up with a table to produce book titles for religious works. This table has three parts. One can use their funky new d16 (if you happen to be a DCC aficionado) or one can roll two d4s and read them as one might a pair of percentile dice. One d4 is the tens place, the other the ones place. This should nicely produce sixteen possible results. Thus, if one rolled 14, 23 and 31 the title of the book produced would be: The Poetry of the Virgin Lioba. I tried to use a bunch of names that could pass as either masculine or feminine, but it is entirely acceptable to render a name one way or the other if it seems necessary. As I have mentioned before, I am not a huge fan of Hollywood. It takes a great deal for me to be interested in actually bothering to go see a movie in the theater. In fact, I tend to place my money with companies and ideas that threaten the current system in Hollywood. I say all of this as a prelude to explain why it is that only now have I attempted to watch the newest Conan movie — a subject that was discussed in some detail leading up to and right after its release, especially by those in the OSR who are REH fans. This discussion did nothing to convince me to see the movie then and it was only until a few days ago that the movie showed up on Netflix. Something else I must admit: my time is valuable, therefore I have no qualms about turning a movie off or putting down a book without ever finishing either if I feel as if they are wasting my time. Unfortunately, the new Conan movie falls into this category. I wanted to like it. I watched it longer than I normally would have. In the end, though, it was unwatchable dreck and I turned it off somewhere around the 45 minute mark. It was enough, however, for me to formulate a theory as to why the new Conan movie failed on just about every level, but most especially as a Conan movie. Hollywood has a history of getting caught up in fads — similarly themed scripts that different studios pick up and produce in order to compete with each other. A recent example is the two Snow White movies that came out this summer. Both start with a narrative about an ancient war in which a powerful magical item was lost/hidden. Both have a vile villain at the head of a huge army in which kills the parent of the hero. Both villains attack a monastery that guards a virgin. Both virgins are necessary for the grand plan of the villain to conquer the world. Both heroes encounter these virgins at the beginning of the movie to set up one of the central conflicts of the movie. The reason the new Conan movie suffered so much was because Hollywood has far more faith in the current fad than it does in the brilliance of any source material it happens to exploit to push forward the most recent fad. One of the reasons I got into RPGs in the first place and why I have consistently come back is the DIY element of the hobby. I am completely free to do what I want with a story/campaign/character and never have to be disappointed by some exec in Hollywood who could care less for the material their movie is supposedly based upon. Today is the feast of St. Kyriake the Great Martyr. The title Great Martyr is given to those saints who had to endure many tortures prior to their death. St. Kyriake was originally accused by a pagan suitor who, out of rage for being rejected, turned the saint and her family into Emperor Diocletion. Seeing her beauty and the wealth of her parents, Diocletion attempted to convince St. Kyriake to renounce Christ. Even after a severe beating, she refused. After this, she was shipped to various places in the Empire to be tortured and tempted. She ended up in Nicomedia (in modern day Turkey), where she was hung in the air by her hair and burned with torches. This only seemed to make her stronger in her faith. Indeed, Christ visited her in a vision and healed her wounds. Finally, her torturers gave up and scheduled her to be decapitated; however, during a prayer just prior to her execution, she gave up her soul in peace in the year A.D. 300. The name Kyriake literally means The Lord’s Day (Sunday) and reminds me of a level of campaign detail that I usually neglect, but wish I didn’t — time and calendars. Although, in theory, such detail allows for player immersion into the game world, in practice I always find that our conception of time is so ingrained that alternate names of days and months tend to take players out of the world rather than farther into it. I always end up redefining these names and time frames back into our own. Therefore, I don’t usually bother. However, I am reminded by St. Kyriake, St. Paraskeve (the Day of Preparation or Friday) and St. Sabbatius (the Sabbath or Saturday) that Greek does have an alternate system for naming days that isn’t too outside our own experience of time to take us out of a game world. For the most part, the days of the week are simply numbers. For example, Monday is the Second Day (of the week). Friday (the Day of Preparation) refers to the Jewish practice of doing all the work for Saturday in preparation for not working on the Sabbath — the Seventh Day on which God rested. Sunday (the First Day) is called the Lord’s Day because it is the day of the Resurrection. This method implies a simple way to tell time that will be easy to associate with our own experience. Months can be replaced with familiar time frames such as seasons (Spring, Summer, Fall, Winter) and days can be named by number — the Second Day of Spring, for example. Alternatively, months could be replaced by the cycles of the moon. Days could be numbered either according to the New Moon or the Full Moon (this could be particularly useful if the world has a magic system tied to the phases of the moon). Personally, I would be tempted to combine the two. To keep it simple, each season would have three moons. Days could be named thusly: The Second Day of the First Moon of Spring. For those interested in maintaining the idea of weeks, there can be 28 days every moon. Thus, the first, eighth, fifteenth and twenty-second days are the Lord’s Day. As a curiosity, this system would have 336 days in a year, 84 days per season, and (assuming the days are numbered from the New Moon), Pascha (Easter) would always fall on the Fifteenth Day (or Third Lord’s Day) of Spring — the first Sunday after the first full moon after the spring equinox. I have to admit that it has been really hard for be to get back into the habit of blogging. I've been spending time with the kids this summer, watching movies, playing, etc. and my actual time spent gaming has been drastically reduced. As such, I haven't had a whole lot to write about and what little time I've gamed has been spent wrestling with actually writing up my version of the Slave Pits. 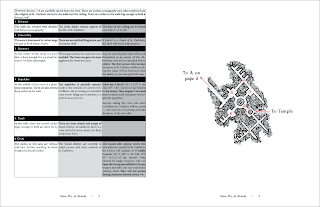 Last month, I posted a rough draft of a layout that might be used to write up a module. As usually happens in this corner of the internet, some awesome piggybacking occurred, and my original idea was improved upon. 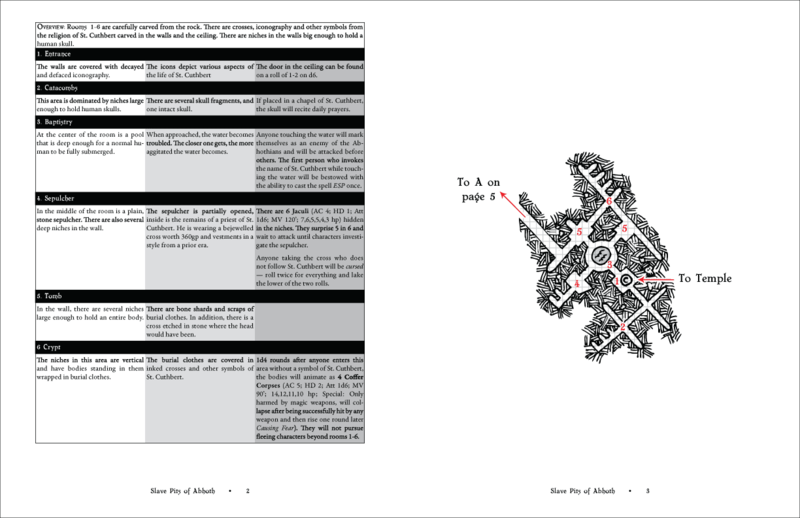 Incorporating these tweaks, I have endeavored to put together an entire spread of how I envision a module might be done using this method. The white column is obvious stuff. The light grey column is detailed stuff. The darker grey column is Referee/DM crunch. The right hand page is entirely dedicated to the section of the map covered by the descriptions on the left hand page. All exits off the map will have a code and a page number to help direct the end user to find the appropriate page when the players move off the map. I would also include a version of the map with all the pieces and parts stitched together. I don't know how efficient this will end up being, but it does represent what I have in mind for moving forward on this project.